Today’s February feature is from Jessica Chase at Consonantly Speaking! Jessica’s posts are always so full of information! I’m so happy she’s guest posting for me today and talking about Auditory Processing Disorders. Thank you for allowing me to guest post, Jenna! Last week on my blog, I had Miss Speechie of Speech Time Fun guest post about tips and ideas for working on auditory comprehension in speech therapy sessions. As there are a significant number of students on my caseload who have difficulty with auditory processing and comprehension skills and some who have language processing difficulties. I decided I would do a follow-up to the entry about how to educate your colleagues/fellow teachers to provide the best learning environment for these students. 1. Professional development for colleagues: Educate your peers through discussions, presentations, handouts, etc. about auditory processing disorder. · According to the American Speech-Language Hearing Association (ASHA), “[Central] Auditory Processing refers to the efficiency and effectiveness by which the central nervous system utilizes auditory information”. Central Auditory Processing Disorder can only be diagnosed by a professional audiologist; although much of the time the speech-language pathologist is the first to notice auditory processing difficulties and often helps in a multidisciplinary assessment with other professionals. Having a diagnosis of Central Auditory Processing Disorder does not mean that the child has a hearing loss. · Language processing disorder is often used interchangeably, but focuses more specifically on the language aspect of the disorder. · A person who has auditory processing difficulties may have difficulties with auditory discrimination, temporal concepts including following directions and sequencing information, recalling directions and information from a story, and have difficulties when there is competing auditory signals. · [Central] Auditory Processing Disorder is a “deficit in the neural processing of auditory stimuli that is not due to higher order language, cognitive, or related factors”. 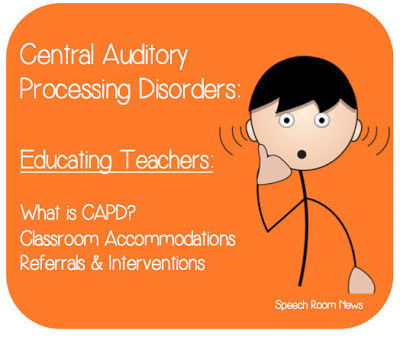 · [Central] Auditory Processing Disorder can co-occur with other disorders including attention deficit hyperactivity disorder, language impairment, learning disability, etc; however, it is” not the result of these other disorders”. · Difficulties in the classroom for students with [Central] Auditory Processing Disorder include but are not limited to difficulty following orally presented directions, understanding orally presented information, answering questions about orally presented information, recalling information from an orally presented presentation/information/story, comprehending information from an orally presented story, sequencing events in a story, understanding and using classroom vocabulary, rhyming, spelling, reading, maintaining attention, using appropriate sentence structure, following classroom routines, and organizing a narrative/writing assignment. · Students may have inconsistent performances in the educational setting. 2. Accommodations in the classroom: Provide appropriate suggestions for accommodations in the classroom setting. · Create a safe environment for asking questions. · Encourage children to ask specific questions related to processing information such as “Can I have some more thinking time?”, “Can you come back to me?”, “Can you repeat that?”, “Can you explain that again?”, “Can you write it on the board?”, and “What does the word ____ mean?”. · If a student would rather use a hand signal, cue card, or other manner of asking for help so that he or she is not singled out, allow the student the opportunity. · Check for understanding by having the student repeat the directions or information, asking the student if he or she understood, asking if the student needs help, or asking if the student has any questions, depending on the situation. · Use visuals in learning including posters, images, writing on the board, highlighting information, videos, etc. · Seat the student in an area of the classroom where he or she can make the best use of visuals, hear the best (such as under a speaker), will not be distracted, and/or is seated next to a student whom can be a productive, helpful learning buddy. · Face the classroom when you speak, use a classroom microphone, or in some cases use an FM system so that students can easily hear and understand you. · Use one-on-one or small group instruction when you can. · Break directions down into parts, repeat directions, and clarify information as needed. · Give additional time after asking the student a question or giving the student information for the child to process and understand the information presented. · Create a structured classroom environment, use visuals when it comes to transitions, and stick to the routine as much as possible. · Provide an outline of classroom notes/instruction for the student to follow and take notes on during instruction and use to study from, if age-appropriate. · Give the student organizational support including graphic organizers, notes/note-takers, preview questions, an agenda/calendar, preview questions, a device to type notes on or send in answers on, etc. as needed. 3. Referrals and Interventions Provided: Educate your peers on the proper referral process and interventions provided by professionals who can treat Central Auditory Processing Disorder. · Speech-language pathologist: Initially, the speech-language pathologist is the first person in the schools to whom a student is referred. The speech-language pathologist can help teach a student listening strategies, phonological awareness skills, age-level vocabulary, advocacy, assist in strategies to help students follow multiple-step directions, organize and sequence information and stories, etc. · Audiologist: Can diagnose Central Auditory Processing Disorder, provide auditory training techniques and exercises, assist in teaching phonological awareness skills, etc. · RtI Provider: Can provide assistance in learning phonological awareness skills including rhyming, phoneme awareness, phoneme segmentation, blending words, auditory discrimination, early reading skills, etc. · Special Education Teacher: If a students’ auditory processing skills severely, negatively impact classroom performance in the areas of vocabulary, reading, writing, or mathematical skills or if a learning disability or otherwise co-occurs with the auditory processing disorder, a special education teacher may also be included on the intervention team. The special education teacher may assist with the student learning classroom vocabulary, reading comprehension, sequencing events in a story, writing skills, mathematical sequencing of steps in a problem, organizing events in a written narrative, etc. · Neuropsychologist: Assesses cognition and achievement to determine or rule-out a possible presence of a learning disability and provide additional information to determine possible therapy interventions. I hope that this post helps you think about how to relay information to other professionals/colleagues who work with children who have Central Auditory Processing Disorder and how to provide the best environment in those students! Be sure to grab this freebie for a text-based poster to use in the classroom or at each group of desks to encourage students to ask questions/advocate for themselves! You can also grab another freebie here for ahandout to give to teachers to educate them about auditory processing disorders. I hope to see you all sometime at Consonantly Speaking! Today’s guest blogger is Jessica Chase, M.A. 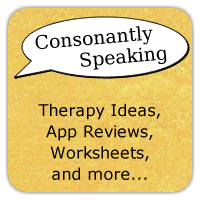 CCC-SLP of the blog Consonantly Speaking! She currently works at a public school with children grades K-12. You can follow her blog on Facebook and educational, speech-related boards on Pinterest. Thanks for posting this! The strategies are perfect for sharing with staff and parents!! Great timing. I have a meeting on a student with deficits in auditory processing tomorrow! Thanks for posting this. I have quite a few students on my caseload with auditory processing deficits. My question is, what materials do you use with 3 rd to 5th graders? Is there a computer program? I use a variety of different things. I definately will be printing your freebies. Thanks! is there a way to copy this…and make it a handout??? I am taking my child in for an exam to see if this is what is interfering in his learning. Any advice.on what I should be sure to ask/tell the examiner? I want to make the.most of the appointment. Nice ideas — I am trying to draw more attention to the impacts of this processing impairment, so offer some additional explanations, observations and resources here: “What is Auditory Processing Disorder (APD)?” http://wp.me/p30k25-2 (see also “Additional Resources” — best of luck to the speech professionals and the kids! In many cases a supportive, kind, and structured setting can do wonders when there is reinforcement of compensatory measures for the deficit that can be frustrating to the child who may be struggling with social communication and processing speed, poor working memory, and other effects. I am curious about the difference between Dyslexia and Auditory processing. How can you tell the difference between the two, they seem to be very closely related.